While reading a document, you may come across some text, or word or figure that is better explained in another location of your document. So cross-reference helps you to create a hyperlink that will take you to the another location in your document. In MS Word you are allowed to create a cross-reference only to headings, footnotes, bookmarks, captions, and numbered paragraphs. In case if you deleted any of the reference types to which you had created a cross-reference you have to update your cross-references. 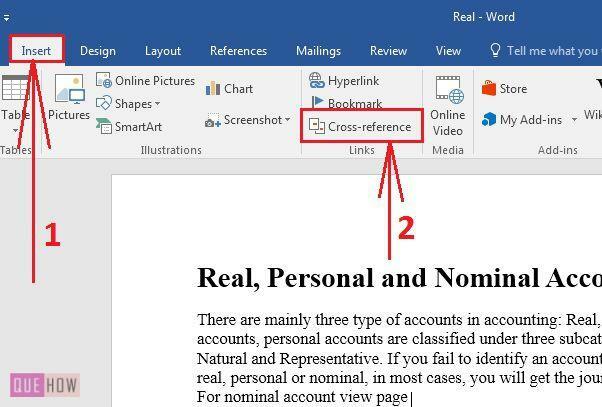 So let’s get started with How to Create Cross Reference in MS Word 2016? 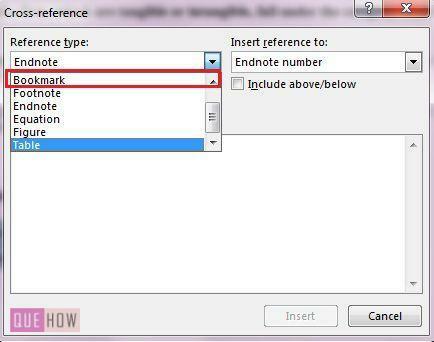 Step 1: Select the position where you want to create a cross-reference in the document. Like, I selected the position after the text “View the page ” you can select position wherever you want. Step 2: After selecting the position click on the Insert tab and under the Links group click Cross-reference. It will open a dialog Cross-reference box. Step 3: In Cross-reference dialog box, you will find two drop-down boxes Reference type: and Insert reference to:. First, you have to select the Reference type you want to link to your cross-reference. I have selected Bookmark reference type. Step 4: After I select the Bookmark as my reference type, a list of bookmarks appears in the For which bookmark: scroll box. Now I have, to select, to which bookmark I would like to link up my Cross-reference. I have selected NominalAccounts bookmark. After that, you have to select what you want to insert to acknowledge your reference from Insert reference: to scroll box. Step 5: Under Insert reference to:, you have Bookmark text which will insert the text of which you had created the bookmark. 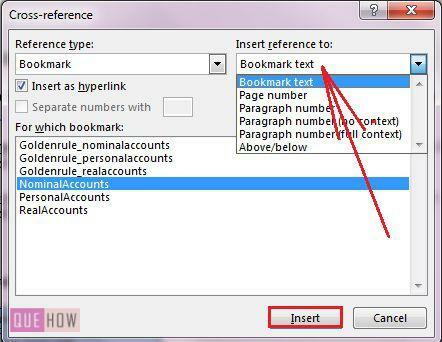 Page number, it will insert page number in the document where you have the slected bookmark. Paragraph number, it will insert the number of the paragraph where the bookmark exists and so on. 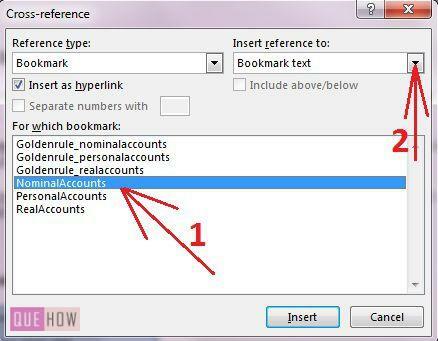 From Insert reference to: scroll box, I have selected Bookmark text, so it will insert the text of which I had created the NominalAccounts bookmark. Step 6: Now you can see that after “View page” text Nominal Accounts text is appearing. It is the text of which I had created the bookmark NominalAccounts. Now whenever you place the cursor over the insert Bookmark text, a message will appear “Ctrl+Click to follow the link” as you can see in the image above. So follow the command and it will lead you to the location where this text appears in the document. Hope the content helped you. Keep reading. How to Create or Delete Bookmark in MS Word 2016? How to Create Insert and Update Citation in MS Word 2016? How to Insert Symbols in MS Word 2016? How to Insert Clickable Checkbox in MS Word 2016? How to use Mail Merge in MS Word 2016? How to Track Changes in Ms Word 2016? How to add a hyperlink in MS Powerpoint (PPT) 2016? How to Create, Add, and Customize a Template in OneNote 2016?